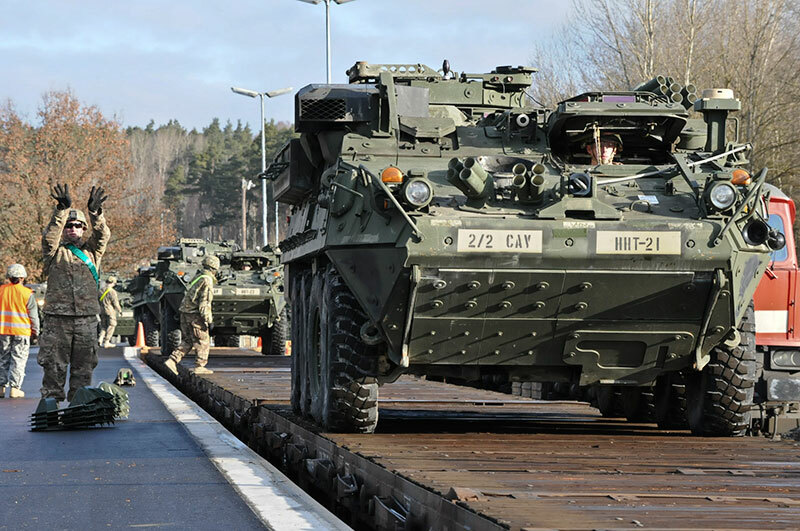 Troopers from 2nd Cavalry Regiment load their Strykers onto railcars as they deploy in support of Operation Atlantic Resolve from Rose Barracks, Germany, March 11, 2015. Under the Army’s new focus on deployment readiness, USAG Bavaria has to find ways to gain efficiencies and reduce resources to buy the readiness we need to support the Army’s mission, said Col. Mark Colbrook, garrison commander at USAG Bavaria. Photo by Sgt. William A. Tanner, 2nd Cavalry Regiment. GRAFENWOEHR, Germany — The garrison commander here hosted a community town hall March 31 emphasizing how the U.S. Army’s evolving priorities will impact U.S. Army Garrison Bavaria. Col. Mark Colbrook described how the Army’s mission will affect garrison services in the coming years, and provided Soldiers and family members with options to raise concerns, ask questions and effect change during this transition. The Army Chief of Staff, Gen. Mark Milley has been very clear with explaining the Army’s priorities. “We must ensure the Army remains ready as the world’s premier combat force. Readiness for ground combat is – and will remain – the U.S. Army’s #1 priority,” Milley said in his initial message to the Army. So what does the word “readiness” imply? The way the Army deployed in Iraq and Afghanistan is “not useful for the world we live in right now,” said Lt. Gen. Patrick J. Donahue III, the deputy commanding general for U.S. Army Forces Command, speaking at an Army symposium last month. So how does readiness — the Army’s top priority — affect Soldiers and families stationed in Grafenwoehr, Vilseck, Hohenfels or Garmisch? Installation Management Command — the Army agency that provides oversight over U.S. Army garrisons, which include USAG Bavaria — has been tasked to take a share of the reductions so the Army as a whole can maintain readiness, Colbrook said. Community members within USAG Bavaria can expect a scaling back of some programs over the next few years so that the Army can buy back operational power. The garrison here, however, has mitigated much of the impact when, in 2013, it eliminated many redundancies when it consolidated Army installations at Grafenwoehr, Vilseck, Hohenfels and Garmisch and re-designated itself as one garrison: USAG Bavaria. Already, changes to the evolving role of the Army in Europe are taking affect. Just last week, European Command announced that U.S. Army Europe will begin receiving continuous troop rotations of U.S.-based armored brigade combat teams, or ABCTs, in February 2017. That will bring the total Army presence in Europe up to three fully-manned Army brigades. A brigade consists of about 4,000 – 5,000 troops. There are only two brigade combat teams stationed in Europe — the 173rd Airborne Brigade Combat out of Vicenza, Italy, and the 2nd Cavalry Regiment in Vilseck, Germany. The last ABCT stationed in Grafenwoehr was the 172nd Infantry Brigade, which de-activated in 2013. Grafenwoehr’s Tower Barracks is outfitted to support and sustain an ABCT. “We must focus on the critical services and be prepared to scale back or eliminate non-essential ones,” he said. At the garrison, that translates into providing quality customer service, and necessary programs to enable ready and resilient Soldiers, civilians and families. Your voice is critical to achieve this goal. Plug in and stay connected to the evolving situation through the garrison’s website, www.bavaria.army.mil, and its Facebook page. Use the following communication channels to tie into the Army’s mission. Community Leadership Information Forum. Similar to Town Halls, the Community Leadership Information Forum, or CLIF, is an interactive gathering of senior leaders to articulate issues carried up the chain of command and provide timely solutions. Many CLIF topics come from the families and Soldiers of a unit. They are specifically identified, tracked on a monthly basis and published as CLIF slides to maintain accountability. Facebook. USAG Bavaria manages an active Facebook page, providing the most up-to-date news, event details and — whenever necessary — crisis communication. Questions relating to a particular post can be submitted, as long as they abide by specific regulations. The USAG Bavaria Public Affairs Office manages the page and is staffed to respond in about two hours during regular working hours. Town Halls. Although town halls are held bi-annually, more information-specific town halls may crop-up on an as-needed basis. These are great opportunities to directly address garrison leadership and engage with others on issues affecting the entire community. Open-Door Policy. As a last resort, the garrison commander has an Open-Door Policy, which makes both himself and his Command Sergeant Major available to any Soldier, civilian or family member to help with any unresolved issues. All command policies are available at www.bavaria.army.mil/policies.